Stunning. Um, why don't I have this set?? tee hee. Oooo, I really like this card. I love the stickles around the edges of the flowers and that color combo is great. What to go girlie!!! What a pretty card! I love how it turned out! This one is supah cool! Tag you're it! Wait! Tag "I'M" it! *snort* Looks like we tagged each other! FUN! Ha, just tagged you as well! Awesome blog, awesome work! Love this card and what you do with the CB embossing folders! Oh no you don't! I just traded for Polka Dots & Petals and now you're gonna make me get Big Blooms too???? AAAHHHHH!!!! Kendra, you've been tagged again...sorry...it's the price you have to pay for being such a cool crafter...love your cards, they are just awesome...TFS! Well I didn't see your tag! So guess what your tagged again!!! Ohhh yes I LOVe these colors together! Great Job!! and yes this set is the BEST! 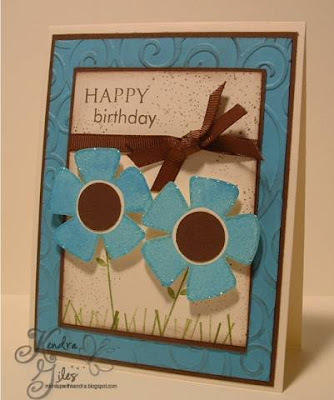 I love your big blooms card! The layout and colors are fabulous! This card is fabulous. Love every little thing!! love the card! love the colors you used! Love this fabulous colors. The dimension and colors are just beautiful. Oh, it's super cute! These flowers are so big and fun! I always love blue and brown together. Adorable card! Love the flowers. I'm a lurker and I haven't posted a comment before, but I wanted to let you know that I really love your blog and your cards stand out from the rest - you are talented! Thanks for sharing your art! I just love all your stuff. I just subscribed so I could get all your updates. I also linked you on my blog. This is adorable, love those flowers and colors. Love reading your blog and enjoy seeing your work.